The Blue Mountains worked their magic yesterday morning. The Phantom Falls were flowing, an event which only happens a few times a year when conditions are just right. 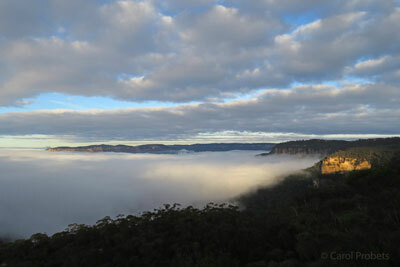 Sunrise over the mist-filled Jamison Valley. To the south of Katoomba is an unusual land formation called Narrow Neck. This is a peninsula which juts out from the main plateau, rimmed by vertical cliffs and extending south for approximately 10 kilometres. At its narrowest point it's only 50 metres wide. Narrow Neck divides two large and very different valleys, the Jamison to the east and Megalong to the west. For the Phantom Falls to appear it needs to be a clear, still morning after rain, when there's plenty of moisture in the air. A layer of fog has formed overnight where the coolest air sits low in the valleys. As the sun rises it warms the air on the eastern side of the Narrow Neck peninsula, slowly dissipating the fog or mist and lowering the air density on that side. 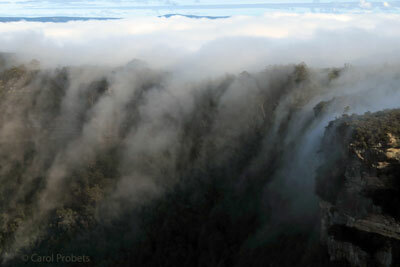 Meanwhile, fog in the Megalong Valley spills over the top of Narrow Neck and pours down the eastern side. Because of the temperature and pressure differential between each side of the peninsula, the fog continues to be sucked across. 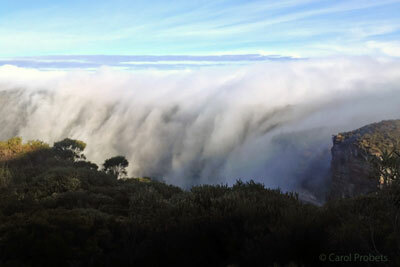 The result is a huge moving "waterfall" of mist flowing down the cliff face, then vanishing as it slides down the sunlit valley slope. 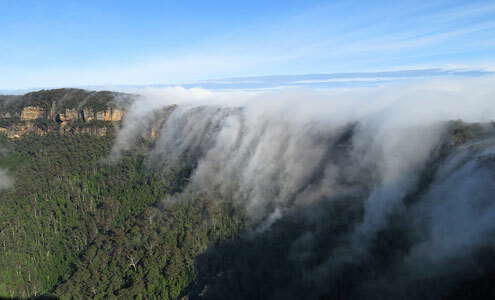 According to the information board at Helga's Lookout, the curtain of moving mist can be 800 metres wide and 50 metres thick, moving at 10–20 metres per second. Occasionally the Phantom Falls flow in reverse, from the Jamison to the Megalong side, but this is rarer and tends to happen in the afternoon or at night. All photos were taken on the morning of 6th August 2016. This article first appeared in August 2016 in Carol's blog.